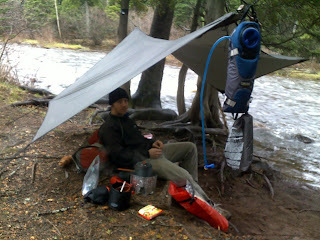 I got back yesterday from a fun trip up to the Superior Hiking Trail (SHT) with my buddy Luke. We've gone a few times, both to the SHT and the Boundary Waters Canoe Area (BWCA), but this time was a bit different in that instead of sleeping in tents, we both had our own hammocks. Luke bought a Hennessey and I made one using info I found from Just Jeff's Hammock Camping Page. On Saturday, after getting up, letting our gear dry (it rained a little bit overnight, though I did stay dry), having some breakfast, etc., we left camp, hiked for a few miles, stopped for lunch, then turned around and made it back to a campsite very much like the first one. It was actually a rather short hike. Much more camping and less hiking than usual. 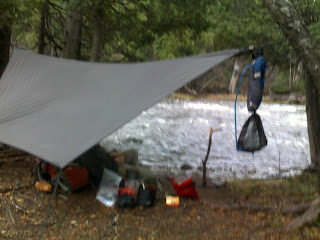 In fact, Saturday, we stopped around 2:00pm to setup for the night. That left us with plenty of time to tweak and re-tweak our gear. 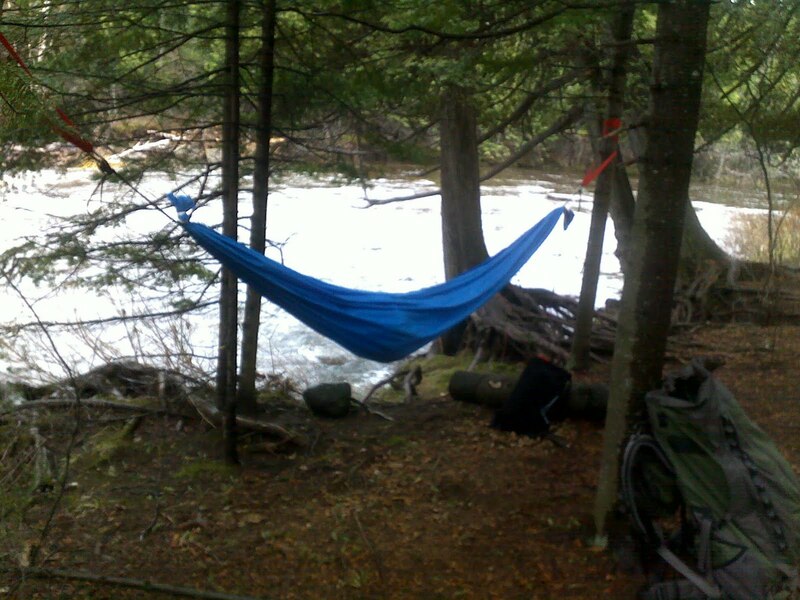 (Luke setup his hammock three times before getting it at a good location.) I had to re-whip one end, as it moved a bit Friday night/Saturday morning. One thing I learned this weekend is that my 20 degree bag -- even without the five degree liner -- is warm enough in mid-may at the SHT that I don't need any extra insulation. I had no sleeping pad, but I did drape a fleece throw below my hammock on Friday night, thinking any wind would keep my underside pretty chilly. Saturday night, I went without it and was still quite warm. That knowledge means next time around, I can significantly reduce my gear's bulk. I'm still debating whether I should buy something more reliable like a Hennessey, an Eno DoubleNest, or a Byer Moskito. At some point, I'll need some protection from insects, and I'm not certain my whipping will hold forever, but it's good for now. And at $20, I can't complain too much about my current setup. I'm looking forward to the next trip hiking -- whenever that is.